Did you know that Karnataka is home to Asia’s first major hydro-electric power station, which was established back in 1902 at Shivanasamudra, and is currently working on plans to build the world’s largest solar park? The state also has an active policy for converting waste to energy, and provides concessions for companies who use recycled water from sewage. Karnataka continues to pioneer other initiatives and has been named a leader in the country in terms of renewable energy policy by two panels of experts from industry and government. This makes it all the more attractive for investors in this sector, especially with incentives such as reducing VAT for manufacturing of photo-voltaic cells. During his opening remarks at the ‘Energy’ panel of Invest Karnataka 2016. P. Ravi Kumar, Additional Chief Secretary, Department of Energy, Government of Karnataka, promised that every household in the state will have access to electricity by 2020. On the technology front, the reduction in energy storage costs should also be a driver for the renewable energy sector, says Tarun Kapoor, Joint Secretary, MNRE. Other emerging technologies are increasing panel efficiency by five per cent. Tracking technology will also improve solar power facility management, said Arul Shanmugasundaram, CTO & EVP, Tata Solar. IoT is also playing a key role in generating data for pattern-driven insights, said Mariasundaram Antony, Head, India Engineering Centre, GE-Power. Analytics can help with efficient usage of power grids and wind data can help predict power output. GE’s engineers in Bangalore are also working on low-wind speed wind turbines. The state has a range of offerings for the entire energy sector. For example, the coastline is a good destination for those who want to set up power plants with imported coal, said Shankaralinge Gowda, Chairman, Karnataka Electricity Regulatory Commission. It is also possible to combine energy evacuation from solar and wind energy on the same stretches of land. India has vast potential in rooftop solar energy generation, and policy incentives can spur this trend, said Stefan Hediger, Head of Energy Cell, KFW, New Delhi. Karnataka was the first state to form separate entities for power generation and distribution (in 1970), and the ESCOMs (BESCOM, MESCOM, HESCOM, GESCOM) are taking customer services to the next level. Other plans include an Energy Centre of Excellence and Incubation Centre in Bangalore, and a Technology Innovation Centre at BESCOM. The Karnataka government is also working with farmers to lease their land for solar and wind power generation, and make them stakeholders in the energy future, said D.K. 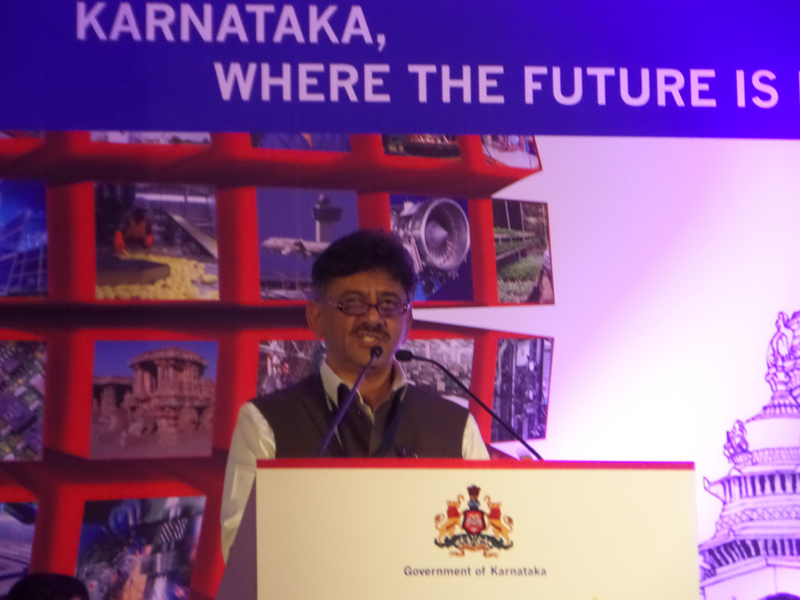 Shivakumar, Hon’ble Minister for Energy, Government of Karnataka. Over 12,000 acres have been contributed voluntarily by Karnataka’s farmers. Further land reform policies will target the renewable energy sector, said G V Balaram, Managing Director, Karnataka Renewable Energy Development Limited. He urged investors to check out the website of KREDL to get more updates on new tenders and projects. Karnataka is growing three per cent faster than the rest of India, calling for more initiatives in using existing energy efficiently and tapping renewables, said Jorn Rohde, Consul General of Germany. Germany is going through a paradigm shift in its energy policy, and is focusing more on decentralised renewables initiatives such as wind and bio-fuels, while phasing out nuclear power. Its experience in reducing carbon emissions by 30 per cent from 1990 should be useful for India too as a source of best practices, said Rohde. Germany experienced only 15 minutes of downtime in its power grid last year, a point of envy for most emerging economies. German technology has also gone into initiatives such as Kochi’s solar-powered airport. The renewable energy sector in Germany already employs over half a million people. Other countries such as Spain have also been attracted to Karnataka over other states of India, said Glen Reccani, Country Managing Director, Acciona Energy. The company will also be manufacturing turbine towers in Karnataka at a Rs 15 crore factory in Bijapur. However, he urged policy clarification on issues like renewable energy subsidies, and recommended that policies be stable and consistent for at least 15-20 years to allow energy companies to plan and execute long-term strategies. In sum, thanks to a pro-active approach and continuous learning, Karnataka will continue to set the pace and standards for renewable energy policy among Indian states, said S. Chandrasekhar, Managing Director, Bhoruka Power Corporation Limited.